1993’s Doom was a benchmark game. It set the standard for first-person shooters that would be emulated for years to come. Some had more success than others, but no game ever captured that unique Doom magic. It saw sequels in the form of Doom II that was more of an expansion pack than a full-fledged release, and Doom 3 which attempted to weave an intricate and compelling narrative, but only succeeded in slowing things to a plodding, monotonous pace. 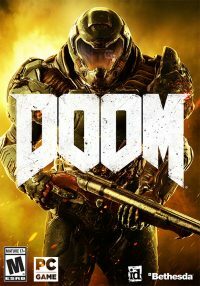 Shortly after the release of Doom 3, work began on Doom 4, and the game went through a long and arduous development cycle, culminating in its cancellation and eventual restarting to finally arrive in the form that we see it today. Has the game’s troubled development cycle hurt the final product? Well that depends on whether or not you’re open to the idea of Doom changing. 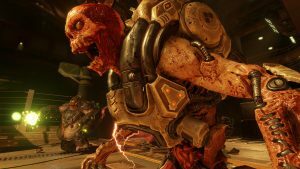 What we have in Doom 2016 resembles the original in a lot of key ways, but differs from in in many others. Doom is a science-fiction/horror themed first-person shooter initially set on Mars. You play the role of The Doom Marine, who wakes up to wind himself in the middle of a demon invasion. The Union Aerospace Corporation has been at it again, and they thought that opening a portal to hell and mining its resources was a good idea. Naturally, things did not go well, and that’s where you wake up, in a sarcophagus in a wrecked martian base. As you make your way through the game, you’ll find out just how badly things have really gone. Narrative has never been very strong in the Doom games. The last time one tried to weave a story into the gameplay we ended up with Doom 3. A game that had some of the elements of Doom, but felt so slow and plodding that it took you out of the experience at every turn. It was not a bad game in its own right, but it was such a departure from Doom II that it hardly retained any of the signature elements of the series to that date. This Doom, on the other hand, does a good job of weaving a story while also not overwhelming you with it. You are given the basics to keep you going, and then if you want to dig deeper there are dossier entries you can look into, as well as environmental clues that help give the goings on some more context. It keeps the game moving along at a good pace, but also gives those who want more detail the option to get it. It’s a good approach that works well here. 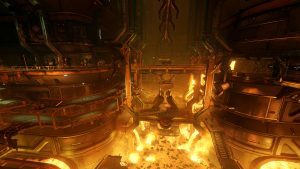 Doom is a game that does a lot of things right, but there are a handful of rough edges that stick out precisely because it does so much right. First is the structure of the game. It involves you basically making your way from one locked room encounter to another, with very little in your way between locations. Occasionally you’ll run into demons on the way to these encounters, but they hardly pose a problem. By making the majority of the game’s combat focused in these arena-like environments, the game very quickly loses any of the tension that it was trying to build. Before too long, you can look at an upcoming area and know exactly that the door will lock behind you and you’ll have to fend off waves of demons. It can get pretty tedious to walk into a room and know you’ve got an arbitrary number of demons to kill before you can leave again, but the thing of it is, Doom’s combat is so fluid, so dynamic, so visceral that you’ll forget about this encounter mechanic and soon will be enjoying dispensing swift death onto the demon hordes. The original Doom had sections of the game that followed this same theme as well, but they were typically larger scale skirmishes. You’d encounter more enemies wandering through the levels, which gave them that sense of tension that this Doom forgoes in favor of its action rooms. You’ll do this with a variety of weapons. Mainstays from the series the pistol, shotgun, super shotgun, chain-gun, etc are all present and accounted for. As is the chainsaw, which has been turned into more of a precision weapon for this game. You have fuel to deal with for the chainsaw, so you won’t be able to simply hold the trigger down and run around. This means that your strikes with it will have to be deliberate, and as a result, are much closer quarters. One of the new combat mechanics in Doom is the Glory Kill system. This is a close-range, melee attack that is absolutely vicious. Dealing damage to demons will weaken them to the point where you can take advantage of this attack. When they turn blue, they’re vulnerable. When they turn orange, you are close enough to them to perform the attack very messily assassinate whatever enemy was in front of you. At first I avoided this, because I felt that it broke up the gun play too much. In the early parts of the game this is an option, but as you get further in you’ll need to make very liberal use of the Glory Kill. Since Health Packs are few and far between, the Glory Kill is the most viable way of replenishing your health. The kills themselves are brutal, quick, and deadly. They are no longer than they need to be. Doom Marine doesn’t have time to dwell on one demon for long, he’s got dozens of them to slay, and they’re not going to wait around for him to be done with their comrade before attacking. The other rough edge is the first-person platforming sections of the game. Doom does this enough to be slightly annoying, but the game is checkpointed heavily enough that it doesn’t become much of a burden. Scaling structures is neat in its own way, but it takes away from the demon-slaying, which is what I really want to be doing. One of the coolest things about Doom is the SnapMap editor. It allows you to easily create your own maps and gameplay mechanics to go inside of those maps. At the moment it is a little limited to what you can do, but hopefully in the future id will expand on it. What you get now is a handful of themes to set your map in, and a big box of pieces to snap together and play with. It works very well, though I am a bit disappointed that there will likely not be any other form of modding for Doom, thanks to its choice of DRM software. It puts the PC version on par with the consoles, meaning there is no advantage to buying the PC version, other than the far better visual fidelity potential. For a studio that’s been traditionally open to its modding community, this is a departure, and it is a little disappointing. On the whole though, Doom’s faults do not outshine the one major thing it does well. It plays beautifully. It’s fun, and feels like a Doom game that was sensibly modernized, without compromising on what made it great to start with. Not everything is how I would have liked or done it, but if you are someone who grew up playing Doom, this should not disappoint. A copy of the PC version was purchased by the reviewer. Overall, I am thrilled with the game. Like you though, Filippo, I am a little underwhelmed by the repetitive arena-style fighting. This was a large departure from the original game, that frankly, I think kind of stinks. I very much enjoyed the random-encounter scenario of the first two Dooms – and this game just doesn’t have that. That came to me as quite a shame. As to Snapmap, I have somewhat mixed feeling about it. But then, I was always an avid Doom map-modder. I made some of the best maps in the Doom community, throughout my experience with it. When I opened Snapmap, I encountered first, only a limited number of pieces you could work with. Not present was any option for making any of your own pieces, nor even modifying any of the pieces which were present. But… if id and Bethesda have plans to improve upon this system, then I have to say it is a very good start. But with how it stands now, it gives the impression that it was rushed just so that it could be made available when the game was released. Also, how to use the various logic bits is very arcane. You get these little pictographs to choose from, without any kind of real explanation for their use. That was unless you were willing to dig through doubtlessly huge tutorials, most of which I gather are online content, as I wasn’t able to find any help files in the map editor itself. But to that I have to admit I wasn’t looking very hard. But even so, if they were there, they should be more self-evident and easier to use. Also, the menu for the editor is very poorly formatted. You have these little diamonds across the top of whatever section you’re in, and either have to click on them (while attempting to memorize what diamond might be what), or you have these back-and-forth shortcut keys to move back and forth in the diamonds, but with the same problem; you are forced to scroll blindly through the categories until you’re able to memorize what does what. It is very obvious that the editor was designed for consoles, then just ported over to the PC with no modification. That was a ‘Shame on you id and Bethesda’ moment for me right there. I was always given to believe that id had an anti-big-corporation culture. Apparently not anymore. Get something done, put a stamp on it and get it out to consumers. That is not the id I remember. My over all score? 2 out of 5 stars. It got the 2 stars because the fighting is superb, and the music score very awesome. It lost anymore potential stars from me because it was such a huge departure from the id culture we have all come to know and love. Just finished the game, and after finishing it, I take back pretty much everything I said above! The jumping was a bit of a pain – but only to start with. I still contend that making players do double-jumps to progress further into the game is a bit much, but after finally getting used to it, I started finding it all pretty easy. And actually started liking it. I just think the way it was introduced was a bit over the top – you had to learn how to start double-jumping as soon as you got those boot mods, or die repeatedly. I think a bit of an easing into the concept by making a level that gave you options to use it, or gave you some double jumps to do that wouldn’t cost you a check-point restart if you missed it (which happened to yours truly a lot at first), would have been a better approach for it. All that being said though, I found the rest of the game to be a huge and devilishly fun meat-fest. The weapons were all beyond cool, and the BFG when I got that…. I got all like, giddy the first time I shot it off! I was like holy crap, this thing rocks! Then there was the artistic style of the game. 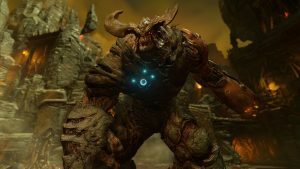 They did with Doom now what its original developers could probably only dream of being able to do – which they would have done had the technology been up to their dreams. The whole interior of the base was pure sci-fi classic – an industrial base on another planet, with all of the sciency doohickeys and scenery anybody could ever ask for. Id pulled out the stops. They spent some serious money on its development, put a lot of love and care into it and it shows. In spades. They set out to make a game that was just, unpretentious fun. And you ask me, they succeeded. Marvelously! Doom is one of the best games I have ever played. Bar none!